Beth’s (Odette Annable) bloody pajamas from the 2008 American monster thriller, Cloverfield. Directed by Matt Reeves and produced by J.J. Abrams, the story unfolds through recovered found-footage in the aftermath of a devastating monster attack in New York City. Beth can be seen wearing her pajamas when the group finds her impaled in her crumbling apartment. Included in this set is Beth's tank top, shirt, pajama pants, shoes, and a bloody men’s dress shirt. 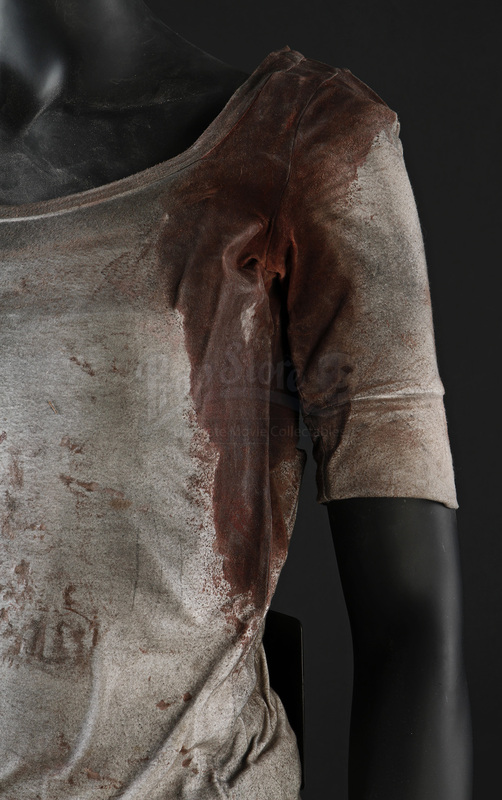 The white American Apparel tank top is heavily distressed from debris and has been dressed with stage blood from Beth’s injured left shoulder. 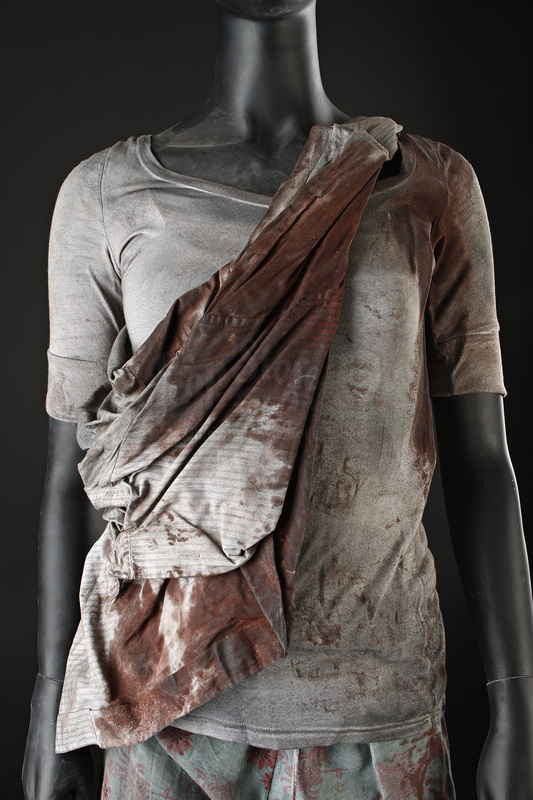 The shirt has similar distress patterns with a larger bloody section along the shoulder, and similar debris covering the fabric. 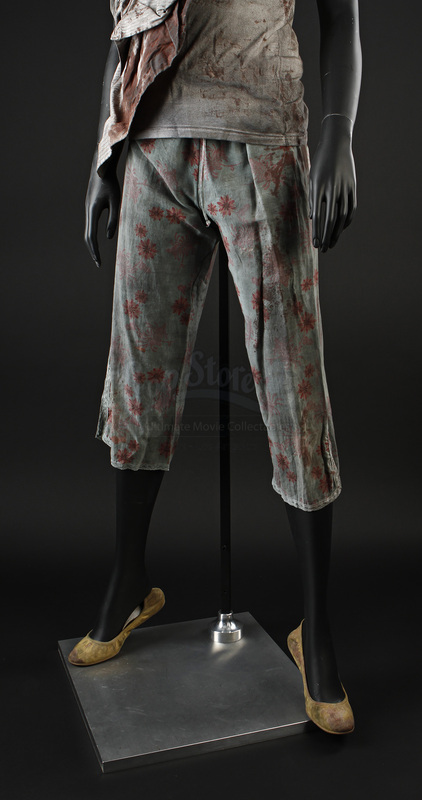 The pajamas are made from a lightweight sea green fabric decorated with a floral design, and feature a drawstring at the waist, light blue lace at the hems, and a small amount of debris and blotches of stage blood. The shoes are standard beige flat soles made by J. Crew that have been covered with grey and black debris. Also included is a men's striped grey dress shirt, which was used as a tourniquet in the film. The tank top is marked as a size small and the shoes are a size 8 (US) women’s while the rest of the costume has no sizing information. Please note that the blouse and men’s dress shirt have hardened due to the use of stage blood, however this costume remains in otherwise very good worn condition.